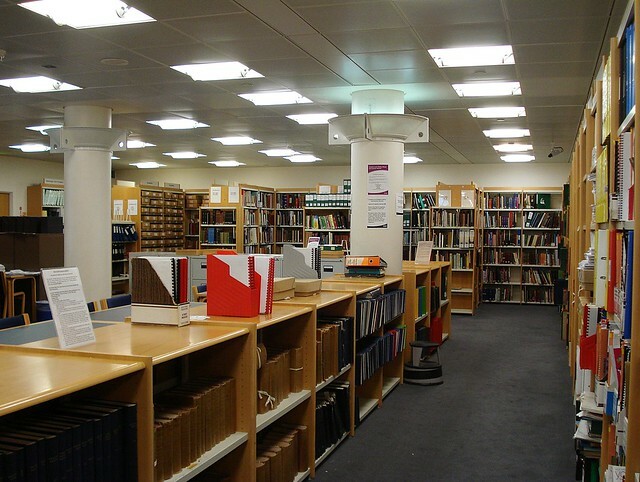 Between 10 December 2012 and mid-January 2013 it looked as if the Croydon Local Studies Library and Archives Service might effectively cease to exist. With staffing levels already reduced after the previous round of cuts, a new requirement to save £105,000 from the council’s budget seemed likely to lead to even further reduction. The budget proposals published on the council website (PDF) spoke of scaling back the archives to the ‘statutory minimum’. Moreover, the proposals included a ‘FTE change’ of 3.00 in this area — in other words, staffing cuts equivalent to three full-time members of staff. Given that the staff at the time consisted entirely of two archivists and one other member of staff (whose remit included work relating to the museum), this seemed likely to render the Local Studies and Archives Service incapable of functioning adequately. Such was the brevity of the announcement that it was impossible to know exactly where the cuts would be implemented. 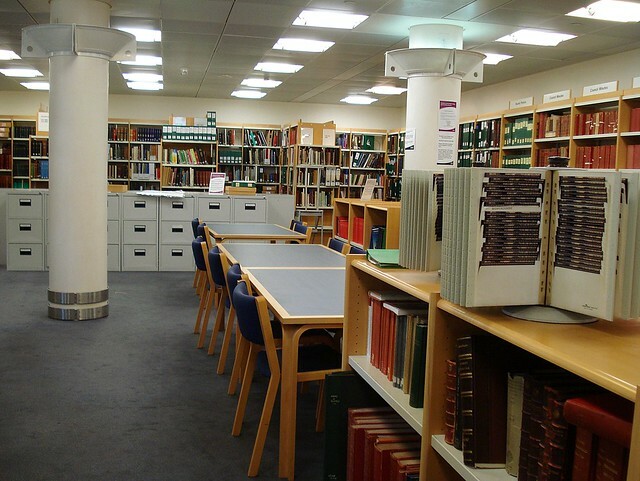 Archive materials at the Croydon Local Studies Library, March 2013. Photo © Kake Pugh, taken by permission of the Borough Archivist. Local historians, family historians, journalists, authors, and other users of the service thus had to be prepared for the worst possible scenario. Other factors influenced this pessimistic conclusion. Staff were not forewarned of the council’s announcement and were given little more information than ordinary members of the public; they took their Christmas holidays uncertain of their own future. The council’s apparent scant regard for its own officers left little room for optimism. Furthermore, the consultation period was very short, terminating just over a month later on 15 January, and the accompanying ‘democracy/consultation/budget-engagement’ document was phrased in such technical language that it was difficult for members of the public to respond to. It was no help that it could only be accessed online. In parallel with the Croydon Citizen’s online campaign, a more traditional campaign was set up by John Hickman, a member of the Norwood Society and of the Croydon Natural History and Scientific Society. This followed the usual course of such campaigns, with radio interviews and letters to the press, to councillors and cabinet members, to other societies and to members of parliament. After initial discussion among a small steering group, this campaign made contact with Councillor Tim Pollard, the cabinet member responsible for the Local Studies and Archives Service, for the Museum Service and for culture in general. Belatedly, Councillor Pollard told the archivists and the museum staff that £75,000 of the required £105,000 had already been saved by not filling two posts which had been temporary appointments relating to the Olympics. The remaining £30,000 was also saved by not filling a vacant post. First World War specialist Emma White had been working in the local studies library since May 2010, but before the announcement of the proposed cuts she had applied successfully for a post in Sussex, funded by English Heritage, to prepare for the centenary of the war in 2014. By not filling her post, the council would save the £30,000. It looked likely that the two archivists’ jobs were not at risk. The other aspect of the campaign was to clarify what was meant by reducing the archives to the statutory minimum. The fear was that the collection of archives and books might be diminished, and further offers of documents such as photographs and school records would no longer be accepted. Fortunately, the National Archives informed the campaign that the term ‘statutory minimum’ need not be so negatively understood, as laws relating to public records give protection to existing archives and recommend the employment of professionally-trained staff. One of the readers’ areas at the Croydon Local Studies Library, March 2013. Photo © Kake Pugh, taken by permission of the Borough Archivist. Moreover Councillor Pollard was replying to the letters and emails that had been sent, assuring the senders that their fears for the local studies library were unnecessary and that the outcome would please them. Public access and the hours of opening would continue and even be improved. What the outcome was to be exactly he could not say, as it would not be made public until the council met on 28 January. He also said a ‘feasibility study’ was to be carried out. The campaign needed to adjust its stance. Uncertainty remained even though its worst fears were apparently unnecessary. Members of the campaign met with Councillor Pollard for the first time on 22 January, hoping to influence the process and outcome of the feasibility study. However, he clarified that the ‘feasibility study’ was not a formal process, and was already being carried out by his own officers. He also regretted including mention of the statutory minimum. When the details were made public on 28 January, there was relief indeed. It was as Councillor Pollard had intimated. The most frequently-used items of stock will move from their present location on the third floor of the Central Library to the former exhibition rooms on the ground floor. This move will improve public access, being more obviously placed, and will also offer better security. The bulk of the archive materials will remain where they are today: in safe storage in the basement. Extended opening hours will become possible, as the better access between the new location and the museum allows for an interchange of staff. There should always be an archivist on duty on the ground floor, assisted by volunteers or museum staff, and the other archivist can then concentrate on the archives. These arrangements please both the archivists and the regular users of the local studies library and archives service: they, and we, look forward to the move, which is likely to take place in the summer. 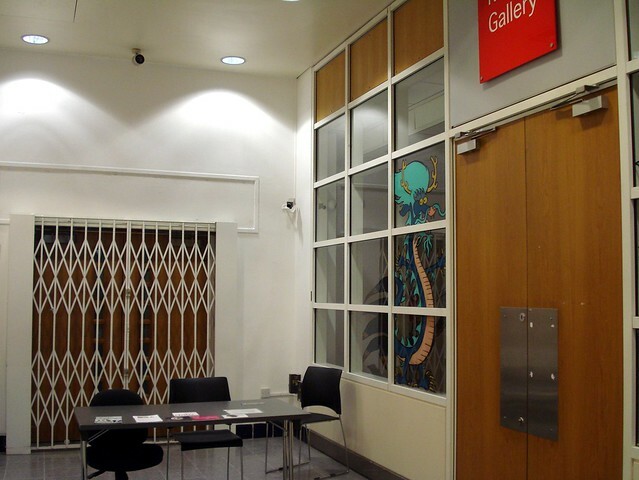 The new entrance to the Croydon Local Studies Library will be next to the Riesco Gallery on the ground floor. This will allow museum and archives personnel to monitor both the gallery and the entrance to the reading room. Photo © Kake Pugh, taken by permission of the Borough Archivist. Brian Lancaster is the General Secretary of the CNHSS - the Croydon Natural History and Scientific Society. those attending up to-date with any further news on the reorganisation. Thanks, Sean. I see from your recent post that one of your correspondents has described this article as exhibiting “More spin that [sic] my mum’s washing machine.” I do wonder if said correspondent has actually ever been to the Local Studies Library. I’m one of the regulars Brian mentions, and I’m happy with the relocation plans, as are all the other regulars I’ve spoken to. The new location will be much more convenient, and there doesn’t seem to be much likelihood that the plans won’t be carried out as stated. I’m no great fan of our political system, but I think this campaign has produced a good result. It’s worth remembering that without the campaign, the outcome could have been very different. Dismissing Brian’s accurate report as “spin” does a disservice to him, to John Hickman, and to all others (including me) who’ve worked hard for this. I’m genuinely pleased if Brian – and others who have emphasised how important the Archive is – feel that a good solution has been found, but I think it’s also pertinent to point out that those of us who enjoyed attending exhibitions in the ground floor rooms feel a genuine sense of loss that yet another element of the broad range of cultural offerings that characterised the Clocktower will now be lost. They were rooms worthy of holding the Picasso exhibition of 1995! They may have been “former” exhibition spaces, closed as a result of the cuts of 2011, but such cuts are easier to bear if there remains scope to reverse them in more prosperous times. The Clocktower became a “jewel in Croydon’s crown” that we could all take great pride in, but we subsequently lost the shop, the tourist information centre, the David Lean Cinema, the Braithwaite Hall, the Arts Bar, the large exhibition rooms (and one or two smaller ones), and workship facilities that were used to offer classes relating to film making, etc. Isn’t it time we said enough is enough? I understand how you feel, but I also think it’s a shame to leave space closed up and unused when it could be occupied. I’m not aware of plans to make irreversible changes to this space on the ground floor, so it’s not out of the question for things to be reshuffled again in the future. The Borough Archivist tells me that he’s in the process of planning an “engagement event” where he’ll be able to provide more details to people concerned about the implementation of the move. Hopefully that will be of interest to you.